Islamabad (IANS): Pakistan Prime Minister Imran Khan on Wednesday offered talks to India and urged that “better sense should prevail” as tensions spiked between the two nuclear-armed neighbours following an aerial engagement between their air forces. Khan’s comments came after New Delhi said it shot down a Pakistan fighter jet in the aerial engagement between the Indian Air Force (IAF) and the Pakistan Air Force (PAF) but lost one of its MiG-21s, with its pilot in Pakistani custody. Pakistan, however, announced earlier in the day that “it had shot down two Indian fighter planes on its soil, captured two pilots and carried out bombings in the neighbouring country while avoiding human loss and collateral damage”. Pakistani military authorities later clarified that they were holding only one Indian pilot. That pilot was identified as Wing Commander Abhinandan Varthaman. As Pakistan claimed capturing the pilot, a video was circulated by Pakistani accounts showing a man in uniform, blindfolded and wounded. Khan said in a televised address to the nation: “Our action was only intended to convey that if you can come into our country, we can do the same. Two of their MiGs were shot down… From here, it is imperative that we use our heads and act with wisdom. “All wars are miscalculated, and no one knows where they lead to. World War I was supposed to end in weeks, it took six years. Similarly, the war on terrorism was not supposed to last 17 years. “I ask India: With the weapons you have and the weapons we have, can we really afford a miscalculation? If this escalates, it will no longer be in my control or in (Prime Minister Narendra) Modi’s. India-Pakistan ties took a solid beating after the Pakistan-based Jaish-e-Mohammed (JeM) outfit claimed responsibility for a suicide bombing on February 14 that killed 40 CRPF troopers in Kashmir. On Tuesday, IAF jets bombed the JeM’s biggest training camp in Balakot, killing a large number of terrorists and their trainers. 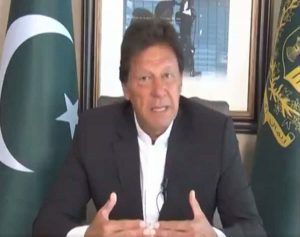 The Pakistan Prime Minister reiterated his offer to carry out an investigation into the suicide attack in Pulwama. “We understand the grief that you have suffered in Pulwama and are ready for a probe and dialogue. Let’s sit together and settle this with talks. “…We have been the victims of war for decades. We know what war means. Since the beginning, we have asked India to share actionable evidence with us. It is nowhere in the interest of Pakistan for it to be used as a base for militancy,” he said. “I feared that India would still take action and I had therefore warned India against aggression. When India stuck yesterday morning (on the JeM training camp at Balakot), we spoke to our Army command and waited to take action till we assessed the damage caused. It was our plan to not cause any collateral damage and not to cause any casualties. “Two Indian MiGs crossed Pakistan’s borders and we shot them down. I also want to state that the pilot is with us,” he said. “I want to now address India and say let sanity prevail. Let’s think sensibly,” Khan added. President Arif Alvi called Khan’s address “very appropriate, precise and compassionate message conveyed to India. “Pakistan wants peace, it is to ready to help in investigation if any actionable information is provided. War has its own unmanageable dynamics, therefore sanity should prevail,” he tweeted. Pakistan Muslim League (Nawaz) leader Ahsan Iqbal said: “All of Pakistan is on one page. We have expressed solidarity with the government and are with them on any action they want to take. Major General Asif Ghafoor, Director General of the Pakistan Army’s media wing, Inter-Services Public Relations (ISPR), addressed a press conference earlier in the day and said “Pakistan wanted peace and India needs to understand war is a failure of policy. “The state, government, armed forces and people of Pakistan have always conveyed a message of peace to India. The road to peace goes through dialogue… War is the failure of policy which India needs to understand. “We do not want to escalate and follow a path which leads to peace. The people of both countries and region at large have a right to live and live in peace. War is not the solution to problems. India should think with a cool head on this offer from Pakistan,” he added.